SHERWOOD — It wasn't exactly a textbook game. There were plenty of turnovers and missed shots. But there was also plenty of hustle, intensity, and exciting back-and-forth action. 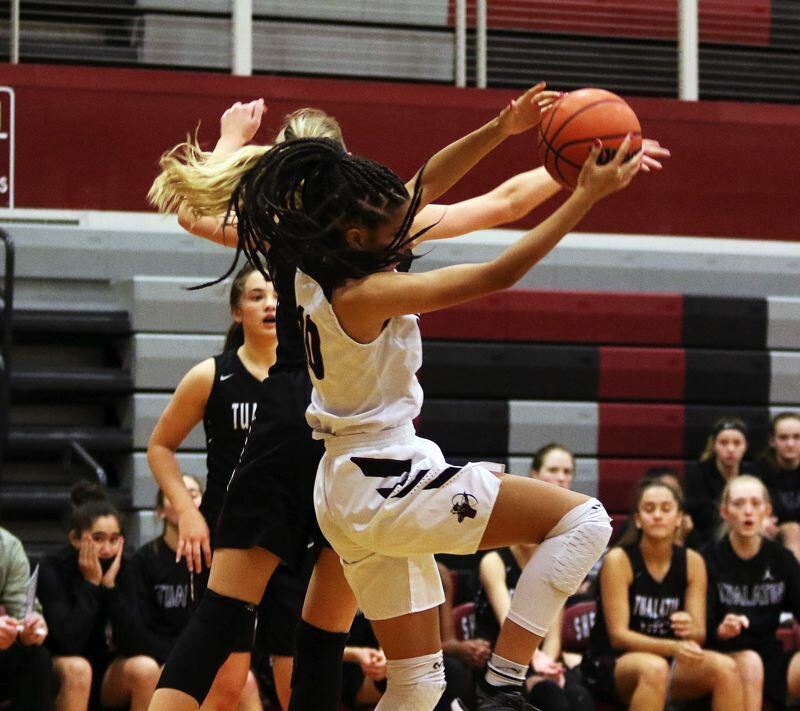 And, for the Tualatin High School girls basketball team, there was one more thing — a season-opening win. In a game where the teams traded momentum, and the lead, over and over again, the Timberwolves came away with a hard-fought 41-38 win over Sherwood in a non-league game played Tuesday at Sherwood High School. 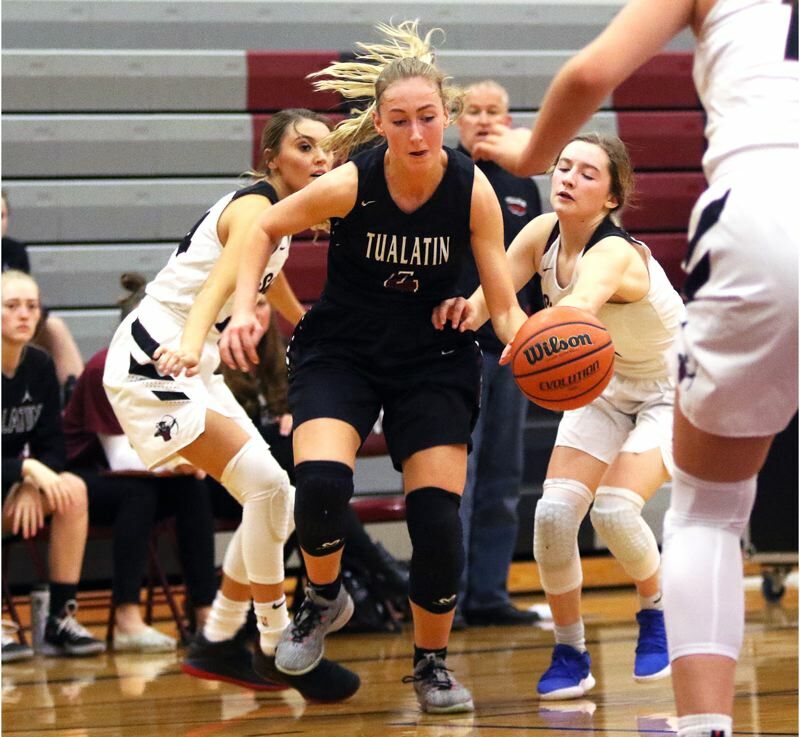 "There were some rough patches, but, for a first game, it was pretty good," said Tualatin sophomore post Natalie Lathrop, who had 16 points and 19 rebounds in the win. "And I think we can make a lot of improvements this season." 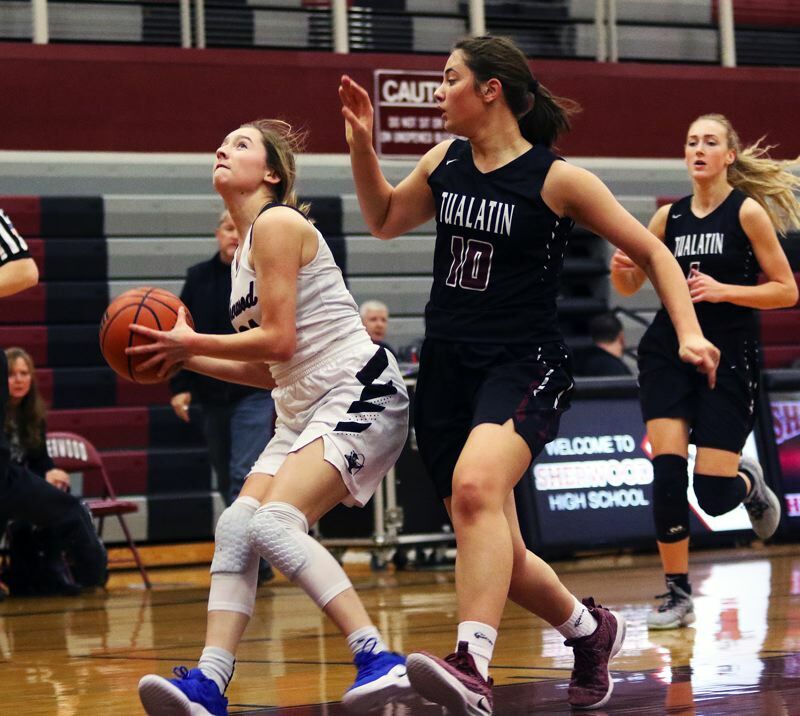 "It was rough at first, but we pulled out the win, so it was good," said Tualatin senior Natali Denning, who also scored 16 points. And it was a win that gave the Wolves a 1-0 start to the season. "It's really important to start off well, and that will carry over to the next game," Denning said. Sherwood moved to 0-2 on the season with the setback. 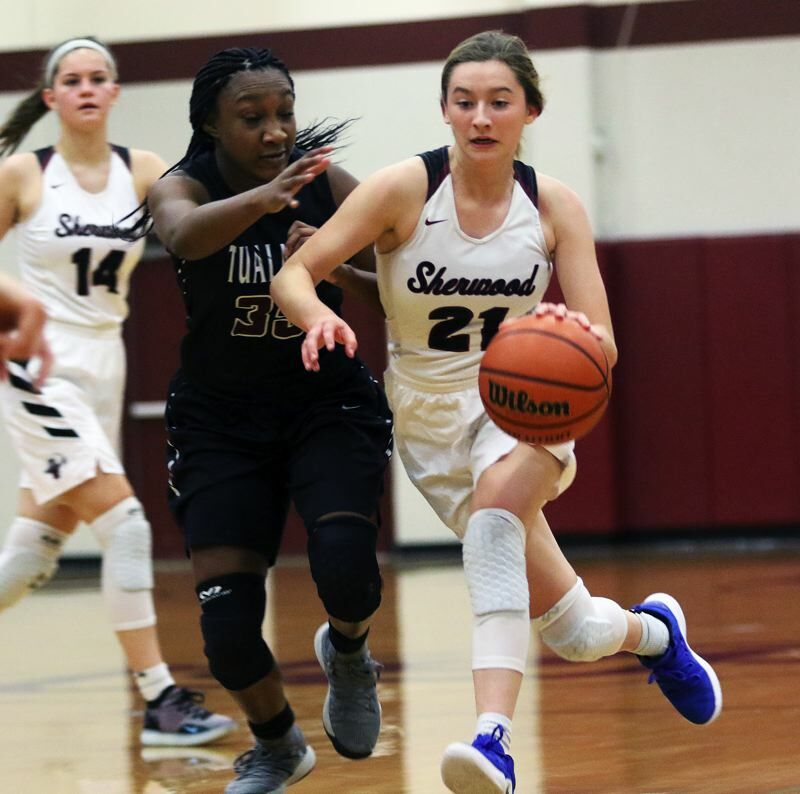 "Finishing, of course, didn't go well tonight, but, honestly, we were on the ground all game," said Sherwood senior Aubrie Emmons, who led the Lady Bowmen with 14 points. "Honestly, I thought we played harder than they did, but they just finished better." Sherwood, with its hustling defense, helped force Tualatin into 12 turnovers in the first quarter. 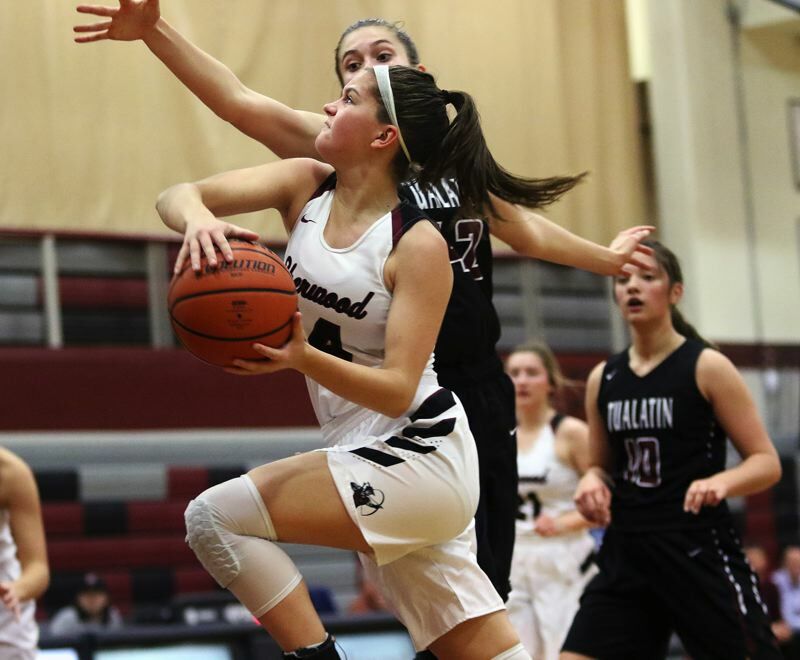 On the other end of the court, Tualatin's defense helped force the Lady Bowmen into a 4-for-16 shooting performance from the field in the opening period. But Sherwood, getting three-point baskets from senior Kaytlin Cooke and Emmons, took a 10-8 lead into the second quarter. Sherwood would push its lead to 14-10 on a pair of free throws by junior Julia Leitzinger coming with 6 minutes and 43 seconds remaining before halftime. But the lead would go back-and-forth the remainder of the period. Tualatin took the lead, at 16-15, on a short-range jumper by senior Maliyah Ross with 2:25 left in the quarter. 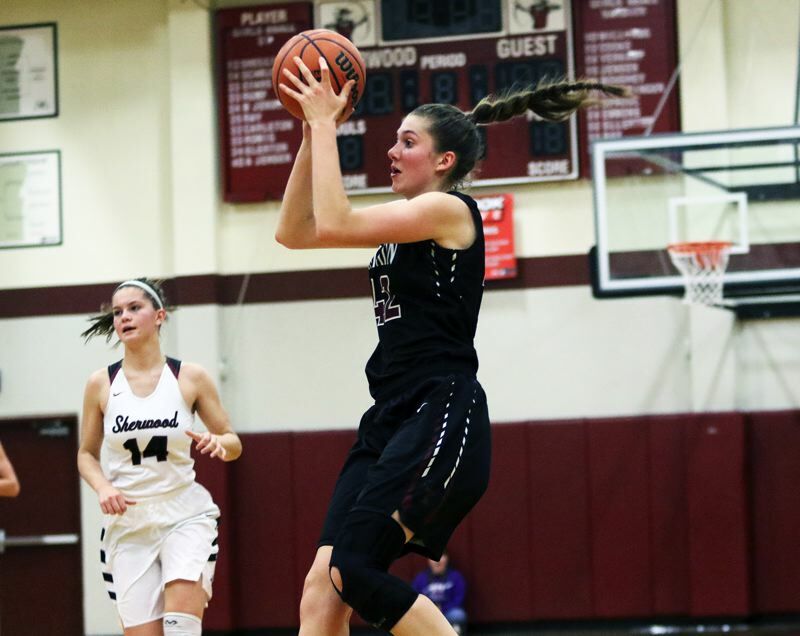 But Sherwood answered with another three-pointer by Emmons, coming off a pass from junior Ava Boughey, giving the Lady Bowmen an 18-16 advantage with 2:07 remaining in the period. The Wolves got four points from Lathrop in the final 1:49 of the quarter, leaving the teams tied at 20-20 at halftime. Sherwood got off to a hot start to the third quarter. Boughey, sophomore Joley Sproul and Leitzinger had consecutive baskets, giving the Lady Bowmen a 26-21 advantage with 5:53 left in the period. Then it was Tualatin's turn to get hot. Lathrop and Denning each scored four points and senior Anna Withers added a basket on a 12-foot jumper, as the Wolves rallied to take a 31-28 lead at the end of the period. 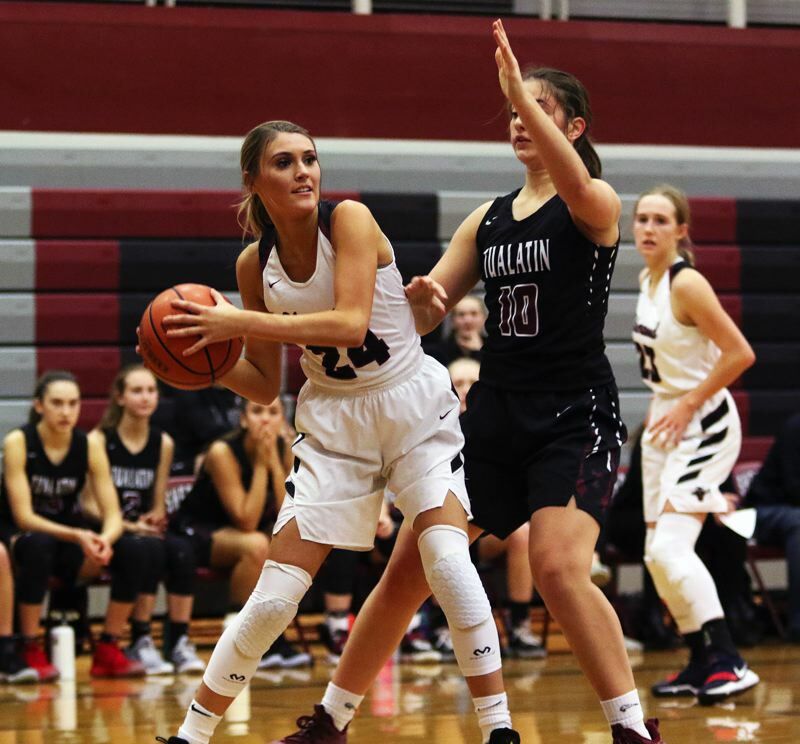 Tualatin opened the fourth quarter with baskets by sophomore Sidney Dering and Denning, giving the Wolves their biggest lead of the game, at 35-28, with 7:13 left in the contest. But Sherwood then came storming back. The Lady Bowmen, getting baskets from senior Alex Verkamp, Emmons, a pair of free throws by Verkamp, and a steal and layup by Boughey, bounced back to take a 36-35 lead with 2:31 left to play. Tualatin quickly regained the lead, at 37-36 on a basket by Lathrop, following a rebound save by Withers, with 1:09 left to play. From there, the Wolves added another hoop by Lathrop and a pair of free throws by Denning, coming with 21.0 seconds left to play, to wrap up the 41-38 victory. "Getting it together in the second half," Denning said of the key to victory. "We had a lot of turnovers in the first half, but only had four in second half. Mentally, we just focused and got out our first-game jitters." "In the second half, we were running the plays correctly and being aggressive, going hard," Lathrop said. Lathrop had a 7-for-12 shooting night from the field, and she had 16 of her 19 rebounds on the defensive end. "There's always stuff to improve on, but the main thing for me when I'm out there is to get a shot when I can, if not, then kick it out for an open three," she said. Denning had four rebounds and three assists to go with her 16 points. Ross added four points for the Wolves. 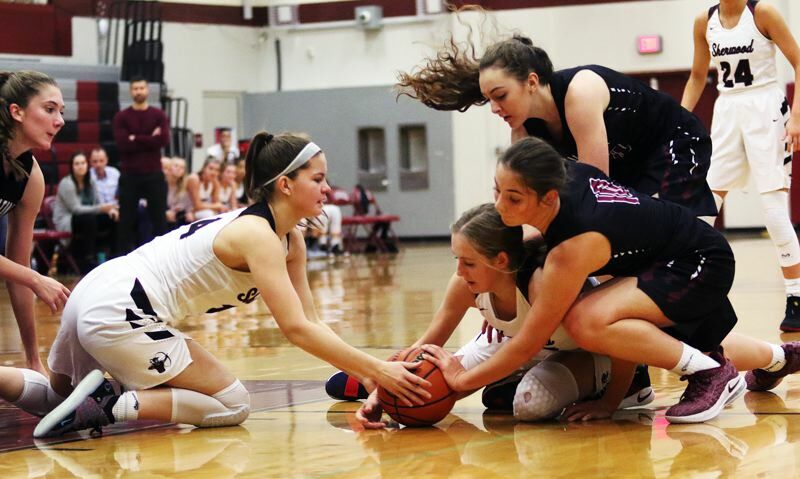 Tualatin, as a team, made 16 of 39 shots from the field, with one three-pointer, and eight of 14 free throws. The Wolves also outrebounded Sherwood by a 43-30 margin. "I think this could be an awesome year," Lathrop said. For Sherwood, Emmons had four rebounds and a pair of steals to go with her 14 points. "Tualatin has always been kind of a rivalry for us. And, for both teams, it's the first few games, so we didn't have film on each other, so it was whoever worked the hardest," she said. "Honestly, we just want to go 10 times harder. More rebounds, more forced turnovers and we're just going to go to practice and work on finishing." Leitzinger and Verkamp each added six points for the Lady Bowmen. Boughey had four points and four steals. Sherwood, as a team, made 13 of 60 shots from the field and nine of 17 free-throw attempts. Both teams will be back in action on Friday. Sherwood will play at Camas, Wash., and Tualatin will host Clackamas in 7 p.m. non-league games.